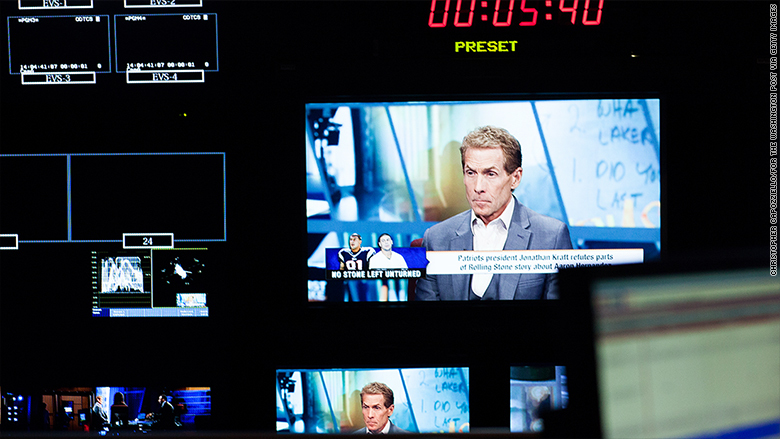 Polarizing ESPN co-host Skip Bayless is leaving the network after more than a decade, and he is widely expected to land at rival network Fox Sports 1. Tuesday's announcement disappointed his fans, but was cause for celebration among others. Bayless was controversial inside ESPN as well as outside. Some staffers thought his presence on the network was downright embarrassing. Sports blog Deadspin called him ESPN's "provocateur-in-chief." His presence attracted viewers to the ESPN2 talk show "First Take," which will continue without him. Stephen A Smith and Molly Qerim will be joined by a new host to be named later. ESPN said Bayless's "final appearance on 'First Take' will be the day after the NBA Finals conclude" in June. His contract expires at the end of August, so he likely will not appear on Fox or any other network until the fall. Fox Sports 1 declined to comment on Tuesday, but the network's programming chief Jamie Horowitz was recently quoted saying "I'm interested in" Bayless as a host. Horowitz is seeking to boost Fox Sports 1 by hiring high-profile "opinionists." And Bayless would fit the bill. Bayless is the latest in a string of boldface names to leave ESPN, including Mike Tirico, Colin Cowherd and Bill Simmons. In addition, Curt Schilling was dismissed. The network could have fought to keep Bayless, but did not. Executives described it as an amicable parting and noted that the network has a deep bench of talent.